Provision for incorporating Ink Jet Printing System with Hot air ink drying. M.S. 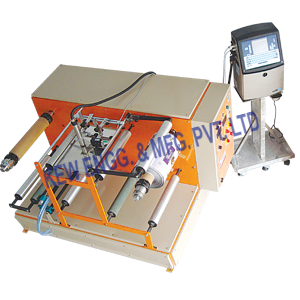 CHANNEL FRAME BODY with mechanical clutch & break unwind / unwind system, unwind / rewind shaft & cones for printed material holding cores for printed material cores, alu- guide roller & all other standard accessories. Max. Max. Parent Reel Dia : 400 mm. Max. Rewind reel dia: 400 mm.